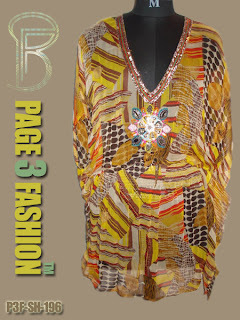 An attractive abstract print kaftan has beautiful beads and sequins work. It is a gracious kaftan for any beach. It has amazing fall and V neck for adding western chic. It sounds so simple yet so attractive. •	Prepared with Viscose Chiffon fabric. •	Comfortable and stylish for any resort and beach.